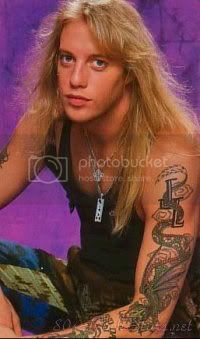 Jani Lane – former lead singer of the glam/hair metal band Warrant, is dead at 47 according to reports from TMZ. Here’s what I remember from my hours and hours of pouring over Metal Edge magazine in my early teens: Jani was actually Johnny (John) but because there are so many Johnny’s out there, he wanted to set himself apart and changed the spelling which also changed the pronunciation- that he hadn’t counted on and added the Lane to complete his stage name. He was from the Midwest, last born in a large family and took up the drums at a fairly early age. His story is the typical scrappy, do whatever you can to be known or famous and when something works, you stick with it story. The first memory I had when I heard of Jani Lane’s death tonight wasn’t about seeing Warrant live, the Cherry Pie video or even any of their wildly popular videos that were an MTV mainstay. My immediate memory was of my best friend Nikki and I writing the lyrics to “Heaven” (from memory) over and over on our Life Sciences notebooks in 9th grade. Once we filled both covers and the entire inside, it was time to buy new notebooks. My second memory was a pool party with our youth group at Nikki’s house. We were playing chicken and being silly, goofy, carefree 13-15 year olds and “Down Boys” came on the boom box. Our pastor’s son asked who that was, someone flippantly said something like “Oh, that’s that new band Skid Row” and Nik and I said at the same time, “NO! It’s Warrant!” Her sentence continued with something along the lines of “and Jani Lane is so hot!” I was more of a (Warrant bassist) Jerry Dixon girl, myself. Growing up in Orlando, FL in the ‘80s and ‘90s was the perfect time and place to be a young, music loving girl finding and honing her musical obsessions. Jani Lane’s Sunset Strip was a short-lived but popular heavy metal club downtown and where I saw some of my favorite bands perform live. Being a part of the MTV generation, videos and music were synonymous for us and Warrant was a seminal band in my musical journey. They had looks, the heavy metal sound I gravitated to, and some of the best videos out there. While primarily known by the passive fan for “Cherry Pie,” I gravitated more toward “Uncle Tom’s Cabin” “I saw Red”(the acousitc version is even better), and “Sometimes She Cries,” which were all penned by Lane. This is how I am remembering Jani Lane and I hope we all revisit our playlists and rummage through our old cd piles tonight for our copy of Dirty Rotten Filthy Stinking Rich and Cherry Pie and pay a little homage to the talented, John Kennedy Oswald, whom I never formally met but miss already.